‘The Truths and Triumphs of Grace Atherton’ is the latest book by Anstey Harris. Between the simple melody of running her violin shop and the full-blown orchestra of her romantic interludes in Paris with David, her devoted partner of eight years, Grace Atherton has always set her life to music. Her world revolves entirely around David, for Grace’s own secrets have kept everyone else at bay. Until, suddenly and shockingly, one act tips Grace’s life upside down, and the music seems to stop. It takes a vivacious old man and a straight-talking teenager to kickstart a new chapter for Grace. In the process, she learns that she is not as alone in the world as she had once thought, that no mistake is insurmountable, and that the quiet moments in life can be something to shout about. ‘The Truths And Triumphs Of Grace Atherton’ is Anstey Harris’ debut novel and is such a stunning story that had me crying in the airport. Grace lives alone and is having an affair with a married man. She feels no remorse or guilt about this, as he maintains that his marriage is over. Grace is haunted by her university past, that left her unable to play her beloved cello in public and instead pushes her passion of creating musical instruments with such precision and care. Her best friends are a elderly, kind gentleman and an outspoken teenager who’s never afraid of speaking her mind, which regularly made for hilarious reading in this coming of age story. I adored Grace, she’s a kind and gentle person with an old soul. Normally when I read books about affairs, I feel conflicted as it’s morally wrong, but I felt an empathy towards Grace as it didn’t really feel that she was doing anything wrong as their love was real and genuine. This book was such a delight to read, the characters and the glamorous setting of Paris creating such a stunning atmosphere to the tale. Words cannot describe how much I loved this, a beautifully written and poignant story with mysterious and fascinating characters. Atmospheric from the first page, this debut evokes so many emotions and tackles issues of self esteem, infidelity and loses, with relatable and believable characters it was impossible to put it down. With a stunning cover and accompanying soundtrack, ‘The Triumphs And Truth Of Grace Atherton’ is a triumph of a debut. 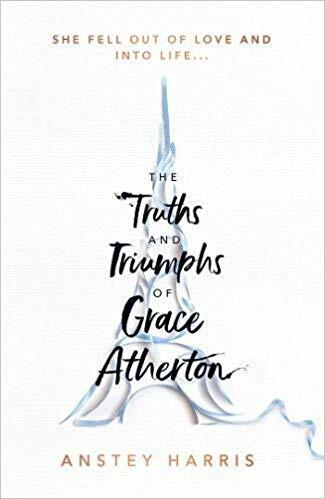 You can pre-order The Truths and Triumphs of Grace Atherton from Amazon and will be available to buy from good bookshops from 10th January 2019.